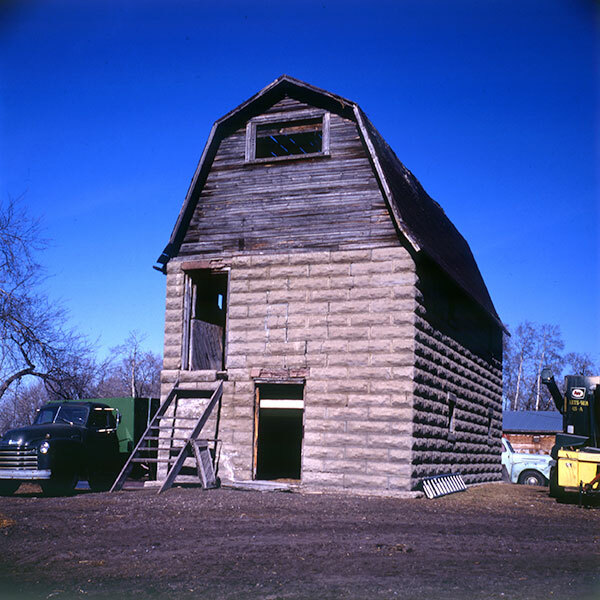 Around 1981, this concrete barn in the Rural Municipality of North Norfolk was featured in a Manitoba Co-operator series on rural buildings. The original caption for the photograph is given below. This tidy little barn that measures only 16 feet by 32 feet is associated with a very large name in early Manitoba agriculture. Located at Andy Giesbrecht’s farm just outside of Austin, the farm was originally owned by Walter Clifford, who had this barn built for him about 1912. Known across the North American continent for his leadership in livestock, particularly the successful Aberdeen-Angus breeding programs he promoted from his large operations in central Manitoba, Sir Clifford used this particular barn for cattle and horses. Built from local materials, the structure was somewhat unusual in that it had a solid concrete second-storey floor. The photo shows the small second-storey entrance that at one time met a narrow earth and wood ramp that allowed horses to be stabled on the second level. Cattle had the exclusive use of the ground level, while feed was kept in the tiny loft and elsewhere on the Clifford farm. The current owner bought the farm from Alf Barber, who had inherited the holding from Sir Walter for long and faithful service as one of the original owner’s senior farm managers. The use of concrete block is not unusual in rural Manitoba buildings although it was not extensively in heavier structures like barns. However, there are reported to be several barns in the area of much larger dimensions with entire concrete block walls made by local craftsmen of the time. At some time since then, the structure was demolished but, according to local information received in 2012, a pile of concrete blocks is still present at the site. We thank Neil Christoffersen for providing additional information used here.